At the bottom righthand corner of this engraving, which is titled in Latin, "Associatio Linguarum" (`the association of languages'), the artist signs his name as "W. Faithorne." This is William Faithorne the elder (ca. 1620-91), whom Anthony Griffiths in the Oxford Dictionary of National Biography describes as "the finest native-born engraver working before the eighteenth century." 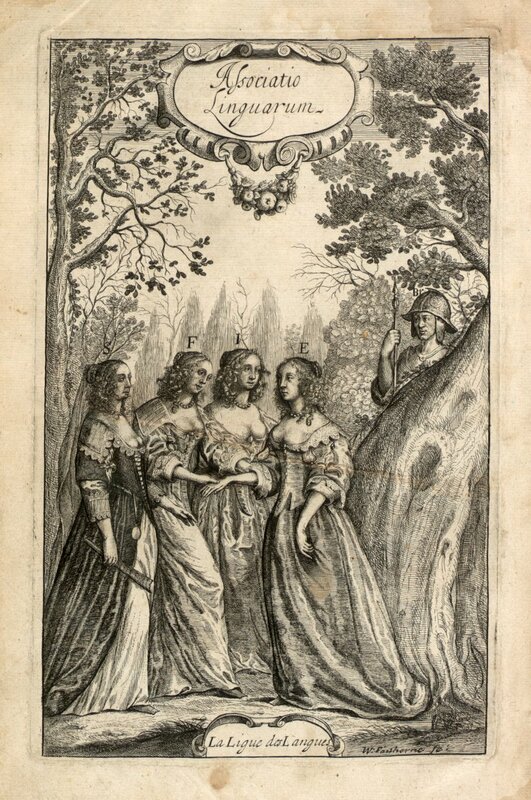 The late nineteenth-century bibliographer Louis Fagan writes that this plate, a frontispiece for James Howell's Lexicon Tetraglotton: an English-French-Italian-Spanish Dictionary (London: Thomas Leach, 1660; LEME 902), depicts "Four female figures emblematical of different countries, with letters above their heads, etc., denoting which they represent" (A Descriptive Catalogue of the Engraved Works of William Faithorne [London: Bernard Quaritch, 1888]: 86). However, Faithorne's original has five letter labels, S (Spanish), F (French), I (Italian), E (English), and Br (British or Welsh). Because their font departs from the elegant italic script in which the title and a caption in French, La Ligne de Langues (`the league of languages'), appear, the printer may have added the letters to clarify the allegory. Fagan could not date the engraving because he did not know that it appeared in Howell's Tetraglotton. Some of the impressions that Fagan saw have the letters "almost erased." In a prefatory poem, Howell begs the "sisters three," French, Italian, and Spanish, to accept a fourth into their "society," English. His prose preface to the "true Philologer" goes on to describe all these women as mother tongues, English as a dialect of Teutonic or High Dutch, and the other three as dialects of Latin. In their décolletage, the four women have a matronly as well as a courtly look. A helmeted soldier who guards their meeting must have been intended to represent Teutonic, but his label makes him British. Howell praises French for her "purity and sweetnes," Italian for resembling "her mother more than the other two," and Spanish (less kindly) as "an open, and masculin high lofty language, so high that she may be sayed to go upon stilts, she is also a wary, and pawsing long-lungd language, delighting in leasurly prolation, and long words." The unsmiling expression of Spanish, whose arm, alone of the three sisters, does not touch the extended arm of English, projects wariness. Conflict between Spain and France, part of the Thirty Years' War, had only recently been concluded by the Peace of Westphalia in 1648. The warmth with which French embraces English, the nearness of Italian behind them, and the standoffishness of Spanish, accurately reflect the influence that they had on English to that date. William Faithorne's engraving emblematizes two of James Howell's themes in Tetraglotton. One is that English now belongs in the "league" of European mother tongues. Another is that "English came to that perfection, and fullnes that she is now arrivd unto, by adopting to herself the choicest, best sounding, and significant words of other languages." Howell admits, with some pride, that English "may be sayed to be Dutch embrodered with French and other toungs." That being thought true, no wonder the English did not produce a great dictionary of their own for another hundred years. Multilingual lexicons offered, it must have seemed to native speakers in the Early Modern period, a most satisfactory guide to the riches of their native mother tongue. Two years before Tetraglotton came out, Howell wrote a poem, titled "Touching the Association of the English-Toung, with the French, Italian, and Spanish," for use among the prefatory materials for his dictionary. Here it is. Except the Pole, who hurles his words like stones. Whence English (though much polishd since) is sprung. Turbands at last unto her Funerall.